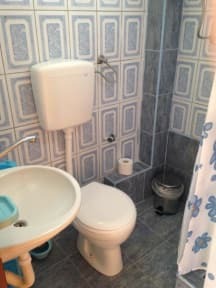 Rooms In i Podgorica, Montenegro: Reservér nu! We are located next to Delta City shopping Mall. Rooms In is a three level house with a garden. 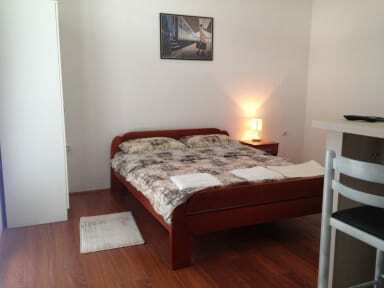 There are six rooms for rent, four bathrooms which guest can use, one living room for guest and kitchen. House free parking for 6-8 cars. Some rooms has balcony. Everything is clean and well maintained.Free Wi-Fi is available in whole area. Some rooms has TV with cable channels. Common room has TV with cable channel and twelve persons can find place to sit. Quite place, but in the liveliest part of the town.The guest will feel like at home in a space which leaves one with an impression of being in a quiet natural environment while staying in the capital city of Montenegro. Place is twenty meters away from the main shopping center in Podgorica, Delta City. Three minutes away from cafes and nightlife spots in the City Kvart district (main hub for students) the attractive part of town. All rooms has the view, closet, chair, small table, new bedding, towels how many guests need, extra blankets, air condition, heating. Beds are mostly new, extra pillow. Kitchen has microwave, fridge, cooker, dishes. Crib is available in double room. Guests can use the living room, kitchen, garden and free parking. If guests have any other request we can help them to find the best solution. Taxes not included.- City Tax €0.90 per person per night. Reception times 8:00 - 23:00.